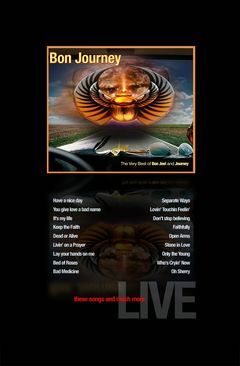 Journey has sold nearly 100 million albums worldwide including 47 million albums in Canada and the USA alone! They have topped Billboard singles charts with power ballads including “Don’t Stop Believin'”, “Separate Ways (Worlds Apart)”, “Faithfully”, “Any Way You Want It”, “Open Arms”, “Send Her My Love”, “, “Who’s Crying Now”, “Stone In Love”, “Lovin,’ Touchin,’ Squeezin;'”, and “Lights”. Sales have resulted in two gold albums, eight multi-platinum albums, and one Diamond album (including seven consecutive multi-platinum albums between 1978 and 1987). They had 19 Top 40 singles, six of which reached the Top 10 on the Billboard Hot 100 chart. Their signature song, “Don’t Stop Believin'”, is the top-selling catalog track in iTunes history, at more than three million downloads. No single tribute act in the world comes closer to the sounds of both BonJovi and Journey like BonJourney CANADA. Crowds pack auditoriums, festivals and events nightly to hear this amazing combination of intricate harmonies, skillful musicianship and of course – the lead vocals of front man Al Langlade. The winning combination of placing both BonJovi and Journey together consistently produce record in-house sales for many venues across Canada and the United States. The act travels by air from an international airport just 3 miles from their home-base.